Have you ever been working on a project, humming right along and without issue, when a disaster jumps right up and bites you? It's almost like Forrest Gump running thorough the jungle carrying troops, humming right along, rescuing people left and right, and that bullet just jumps up and bites him. That's how I felt when the hot water tank went bad. No option other than to derail what we were doing (the bathroom) and begin concentrating on our replacement hot water heater. 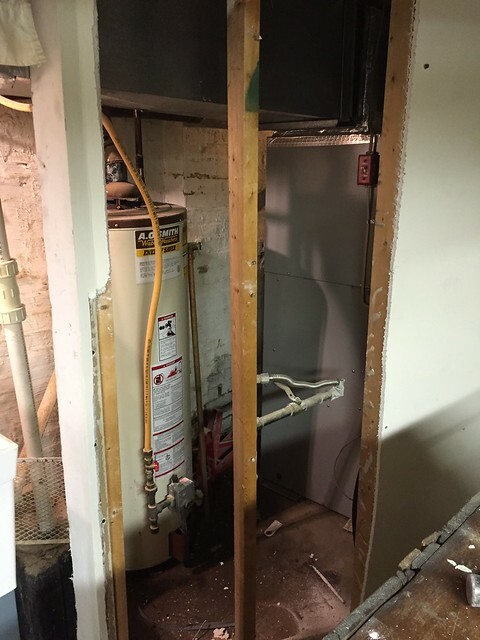 Last week we told you we'd decided on working with local company, Tankless Concepts, on the install of a new tankless water heater for our home. But before we'd be able to get the new unit in place, we'd need to do some prep work in the giant disaster of a basement to clear the way for the replacement, and we'd also need to figure out what brand of water heater we'd ultimately purchase. First let me bring you up to speed on the timeline. Our water heater broke early Saturday morning, I started researching our options all day Saturday and ultimately decided I really wanted to look into tankless by Saturday evening. By this time I was on the Rinnai, Takagi, and Navien websites looking at the various models we could choose from. I was paying attention to efficiency, flow rate, venting...you know, normal Saturday evening fun stuff. By Sunday morning I'd found the Tankless Concepts contact info via the Navien website and was able to reach them by phone. Yes, by phone, on a Sunday. I spoke with Linda, who was tending the booth at a trade show, and filled her in on the details of our situation. She said she could get someone out that day. By about 2:00pm, an estimator by the name of Ed was at our house to look over our stuff and provide advice and ultimately a quote. 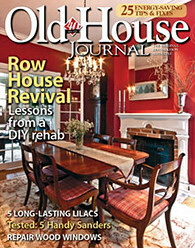 Ed was headed to the home show in Chantilly, Virginia when we called, at least 45 minutes away, but he detoured to our house to look at our job. 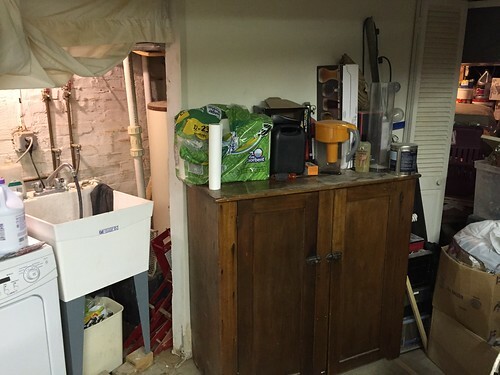 As it turns out, I later learned that Ed is also the owner of Tankless Concepts, but unlike many business owners, he didn't feel the need to bring this up, instead just focusing on the task at hand, getting hot water back into our home. We've worked with other companies where the owner can do little more than talk about how he's the owner, and he tries to make you feel like you're special since he is gracing you with his presence. It's not that way at all with Ed, and that was a great surprise. Ed spent about an hour and a half at our house, looking at the install, possible venting location, our needs, our preferences, and also educating us on tankless and their advantages/drawbacks. It was a great experience where we learned a whole lot without feeling forced into a decision. 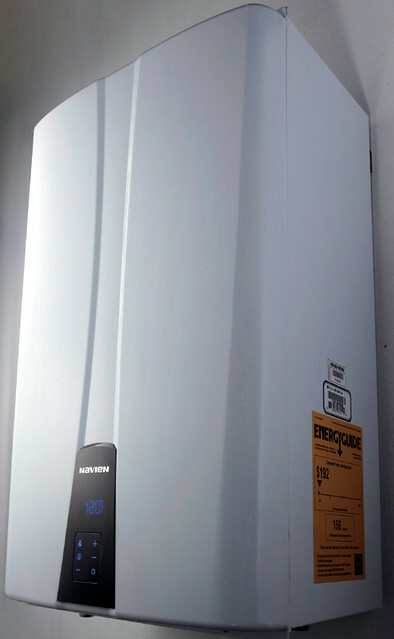 After all was said and done, Ed left us with some literature and a decision: would we like to install a Rinnai or a Navien tankless water heater? The debate was now on for Wendy and me. Ed had recommended a Rinnai brand heater due to their reliability and install base. They are the most popular and widely installed brand in the United States, and the brand Tankless Concepts installs the most. They also have the lowest profile vent requirements, and a good reputation. But he also told us a little about the Navien brand, including the buffer tank, combi units (boiler plus hot water heater), and their efficiency. In addition to the units, he went into great length to explain the idea of a "cold water sandwich," and how one can avoid this soggy deli snack sounding event. We had our homework to do and a hard decision to make. After a few days of debate of weighing our options we made another pro and con list for each, only singling out the things that actually differentiate the two units. Cost, flow, efficiency, and many other items are essentially equal. Better chance for "Cold Water Sandwich"
While there are obviously way more features, considerations, and comparisons that can be made between the two, these lists are the items that really matter to us in our selection. When the quotes came back they ended up at almost the same amount for either unit, which made it so we could base the decision entirely on features. After careful consideration and extensive discussion, we decided on a Navien NPE-240A unit. It would deliver the amount of water we'd need, would help with the CWS, and would ultimately work best for us in our home. With the specific unit decided, we were nowhere close to home free. We still had some work we'd need to knock out before the guys showed up for install a few days later. Our old hot water heater was installed behind a weird partition wall that was probably put up in the 1980s. It does little more than make our basement feel even more cramped. 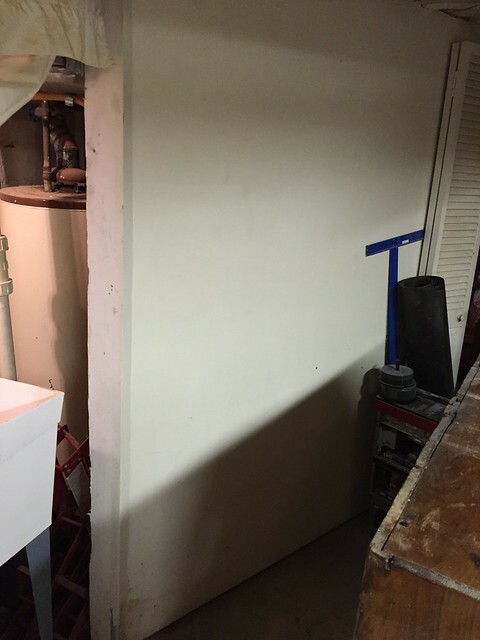 In order to remove ye old tank and install a new tankless, we'd need to take this wall down. Not wanting to be totally left out of the fun, and in order to save a few dollars on the estimate, we opted to take this walk down ourselves. It's non load bearing, non finished on one side, and completely unnecessary. It would feel great to get rid of it. Given just how horribly the wall was constructed, it actually came out quite easily. 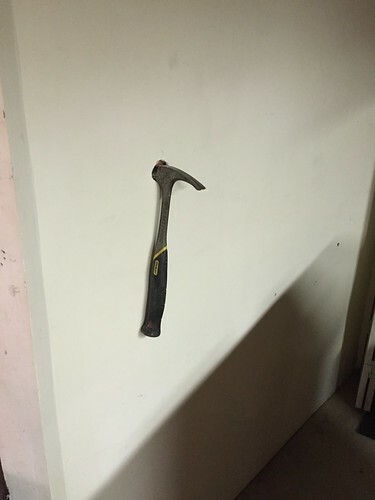 I started like any good overzealous HGTV renovation show, with a hammer to the wall. The thing is, that's where the cray flailing and taking my aggression out on our house stops. 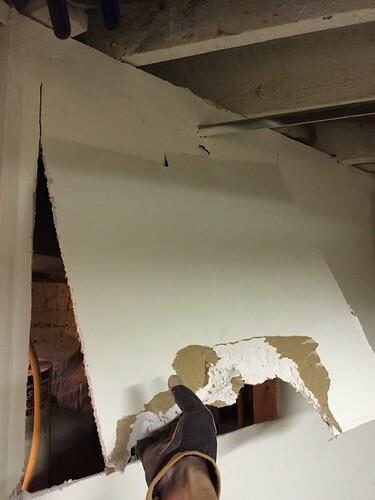 I know it makes good TV to take your aggressions out on perfectly good drywall, but it also makes a giant mess. 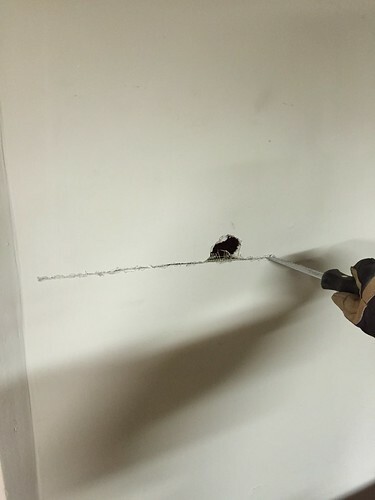 Once I have a small hole, I use my drywall saw (or a saws-all) to cut a few strategic lines that allow me to take the drywall out in large chunks. It's a little thing that the dramatic TV shows should really teach people. It would mean a whole lot less mess, difficulty, damage to pipes and wires, and even injuries. Once it's started it all tends to go pretty quickly. One cut leads to the next and before you know it, you're ripping out the shoddily built partition in the basement. Wall removal and cleanup probably took me about three hours total. But the weirdest thing about it is the fact that we've lived with that wall where it is for the last 11 years, always wondering why someone built it and put it in place. It took us until we had a near disaster and needed to replace our water heater before we'd actually take to removing this giant piece of garbage. Almost as soon as the wall was gone, we essentially forgot it was ever there, and wondered what had taken us so long to get that thing out of our house? 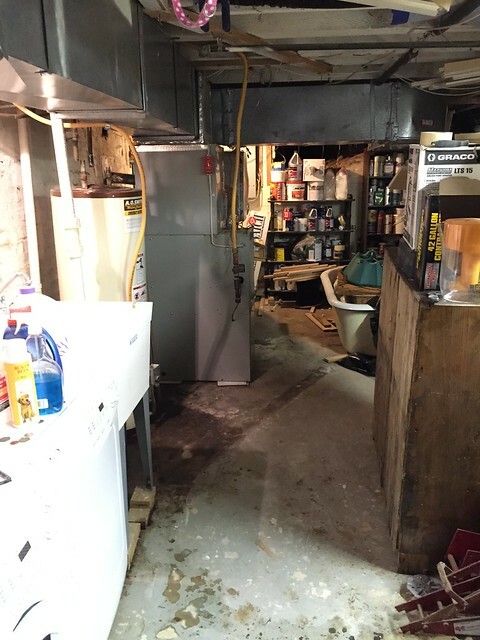 It suddenly made the whole basement feel so much more open, and it also made us want to rip out so much more! We had a glimpse of what our basement could look like as a large finished space, and we couldn't help but daydream. We can get rid of the duct work by replacing it with a boiler, we could stack the washer and stupid dryer in a back corner, we can re-route water and other wires and make it a full height ceiling with partially exposed glossy painted beams. I can see it! It can be glorious!!! Oh, hi there bathtub, I almost forgot you were back there! Daydream as we may, we still had a task at hand. The installer would be coming the next day, so we moved as much of the debris outside as we could so we would have room to work. One other thing I want to share today is how bad our water heater looked. 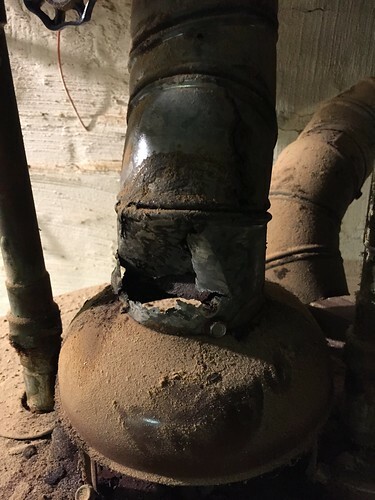 Years of poor maintenance (by us included), a bad install, and the inefficient function and venting left it looking rather worse for the wear. Just look at how bad the vent cap was. I could push my finger right through the metal. It's a bit hard to see because the photo's so dark, but it was not good! Next week we'll fill you in on all of the details of the install itself. Our installer, Brent, has graciously agreed to allow me to hover over him and generally annoy him all day when he's working at our house, so I'll be able to chronicle the whole thing and lament the fact that I wish I could have just done it all myself. But sometimes you've got to call in the pros, and there's nothing wrong with that (or at least that's what I keep telling myself). So what do you think about our now open basement? Can't you just see a nice living space? Maybe a basement bathroom? Perhaps a bookcase with hidden secret door that gives access to a temperature controlled wine cellar? Yeah, I agree, I can see it too! Stack the W/D in a back corner? A dark, dirty, dingy, cramped back corner? What does Wendy think of that? Hoping for you guys that this hot water issue is all done soon! Lucky for Wendy, I'm the laundry person in our house, so I get to decide how gross the laundry area gets to be. Some day I hope to have a legitimately nice laundry area, and that means without gross dirty floors. I'm very torn on this. A cool hidden room has always been a dream, but you're absolutely right on having the cool stuff on display. I'm confused - I assume with the duct work you have forced air, are you considering going back to hot water? What will you do for ac? Oh the questions! We have forced air right now, but it's a bit of a mess. First floor forced air furnace with all that duct work in the basement. Second floor we have forced air AC with an electric heating element, air handler in the attic. In a perfect world we'll remove the furnace and duct from the basement and replace it with staple up radiant floor heating throughout the first floor. We'll also have a pex loop up to the attic air handler and install a hydronic coil for forced air AC and heating on the 2nd floor. It will free up so much space in the basement. If we ever finish the basement we'll do radiator heat in the basement with a mini split or something for AC in the basement. I think our next post might sell you on tankless. It's a very straight forward install and great results in the few weeks we've had it. I'll be interested to hear about your install. 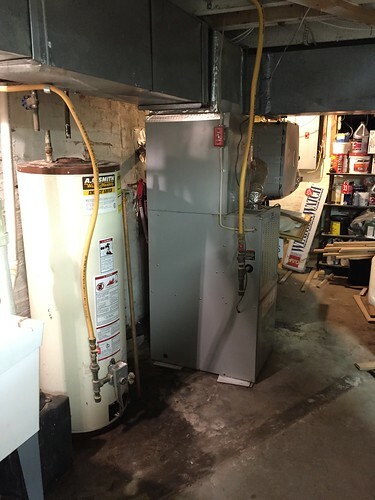 We contacted our local rennai installer, and he pretty much didn't recommend it because our ground water is too cold and it actually is more expensive to run than a tank water heater in Michigan for a "full time house." He only recommended them for vacation homes. I've always wanted one just because they are cool though! Stay tuned, I think you'll like the install post. 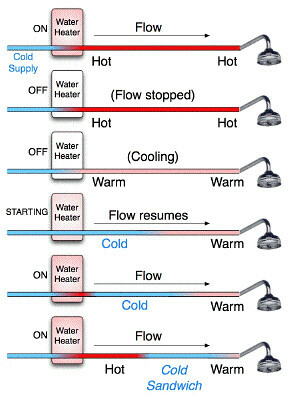 The incoming water temp is an issue, and the colder your water, the harder the heater needs to work to deliver the agreed temp. I'd assume it would be a bit more expensive, but I think the bigger hit is on your flow rates. Cold water means lower volume since the temp says constant. Like you, I've always wanted one for the coolness factor. HAH! Only 10 if we're lucky! That's ridiculously scary. I think it's time anyone who sees this goes to take a look at their own water heater. I am ashamed to admit I'm not sure when the last time was I even needed to, but we've been having water pressure issues lately that I've been ignoring on purpose, hoping with futility that it would just go away. No surprise that it's gotten worse. I'm getting off here to inspect, and am sure a trip to my home improvement store is going to come tomorrow. Exactly. We even inspired our neighbor to replace her water heater. Makes sense, it was the same unit as our broken one, installed at the same time. Ed and Brent from Tankless Concepts installed our tankless hot water heater over 7 years ago and we have been very pleased ever since. 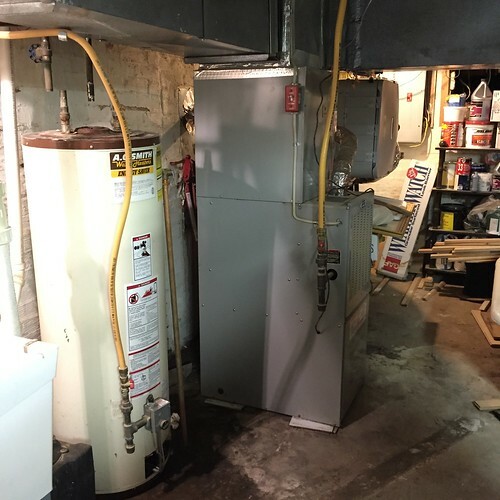 They were recommended by Rooftop Chimney when it was determined that our tank vent up the chimney needed to be replaced and it would be more cost effective and a space saver to go tankless. Enjoy! That's awesome. I can't say enough good things about them. Yes! 1000% yes. I always kept a CO sensor down there just in case, but it was only a matter of time until it would have ended up an issue. I much prefer the venting setup with PVC. Feels much safer. I tried Navien heater and it work good for me. Even I further reviewed few more models at my site.